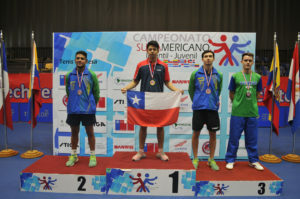 Members of the Brazilian outfits that had enjoyed success two days earlier, on Sunday 17th March, Shim Joon, Guilia Takahashi and Laura Watanabe added to their gold medal tally at the 2019 South American Junior and Cadet Championships in the Chilean capital city of Santiago. Guilia Takahashi was very much the focus of attention; she partnered Laura Watababe to claim the cadet girls’ doubles title, before achieving the same feat in the cadet mixed doubles event when partnering Shim Joon. 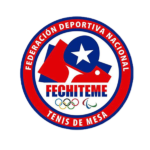 Top seeds, Guilia Takahashi and Laura Watanabe secured the top step of the podium at the final expense of surprise finalists, Ecuador’s Marla Borja and Alisson Loor, the no.10 seeds (11-6, 6-11, 11-8, 11-7); the Ecuadorians having ousted Chile’s Fernanda Araneda and Sofia Vega, the no.9 seeds (2-11, 11-7, 11-8, 12-10) one round earlier. Significantly, the previous day, Fernanda Araneda and Sofia Vega had beaten Colombia’s Juliana Lozada and Sofia Varela, the no.2 seeds (11-3, 12-10, 8-11, 11-6). Success as status advised, in the cadet mixed doubles event, the situation was somewhat different, Shim Joon and Guilia Takahashi commenced play as the no.2 seeds; in the closest final of the day they upset the odds to claim the title at the expense of Peru’s Carlos Fernandez and Maria Maldonado, the top seeds (12-10, 11-13, 9-11, 11-7, 11-9). 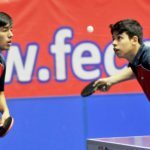 Silver for Carlos Fernandez, gold for Shim Joon; earlier in the day, it had been the opposite scenario. 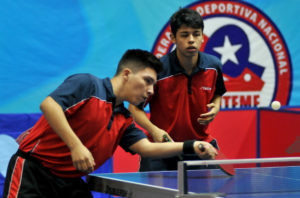 In the final of the cadet boys’ doubles event, occupying the top seeded spot, Carlos Fernandez had partnered colleague Adrian Rubinos to success against Shim Joon and Henrique Noguti, the no.2 seeds (11-7, 11-7, 12-10). 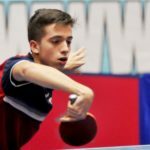 Proceedings conclude on Monday 18th March when the cadet boys’ singles and cadet girls’ singles events will be played to a conclusion.